February 6 – FIFA has demanded a full investigation into allegations of match-fixing in Kenyan national team matches. 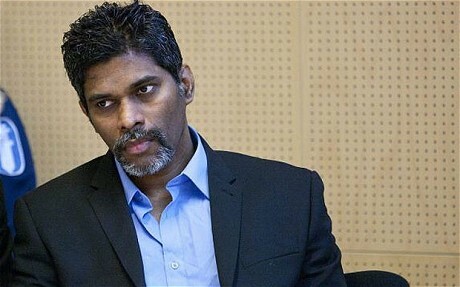 Former Kenya international George Owino and convicted match-fixer Wilson Raj Perumal (pictured) are believed to have manipulated matches involving the Harambee Stars, including a 2010 World Cup qualifier. The pair feature in a ten-page FIFA report, detailing their activities to alter the outcome of matches based on e-mail exchanges between the player and the match-fixer. The governing body says it has prima facie evidence of the duo manipulating and influencing high profile international matches. “Mr Owino … appears to have conspired to manipulate international matches and enter into corrupt agreements with Mr Perumal,” states FIFA’s preliminary investigation report. Kenya’s 2010 World Cup qualifier against Tunisia is part of the investigation. The Tunisians won the game 1-0, but Owino, a Harambee Star between 2008 – 2015, has denied any wrongdoing. He played his club football in Tanzania and Kenya. Perumal is a notorious match-fixer. He has been convicted previously in both Finland and Hungary having first been jailed for match-fixing in 1995 in Singapore. In a 2015 Al Jazeera report Perumal claimed that he rigged Kenya’s 2010 World Cup qualifier against Nigeria in 2009 to help the Super Eagles on their way to South Africa. Perumal has not commented yet on the latest allegations. The FIFA report is dated September 2018. Perumal is also alleged to have contacted other players in the Kenyan national team. The Singaporean sent his instructions via e-mail. “Note that if u loose (sic) by 1-0 to Tunisia u will end up with nothing. I want a 3-0 score line,” read one e-mail. The investigation also expands to claims that Perumal wanted to influence unidentified games at the Nile Basin tournament in Egypt in January 2011, a friendly between Kenya and South Africa, and the plan for Owino to play at an unidentified football club in Australia to manipulate matches.